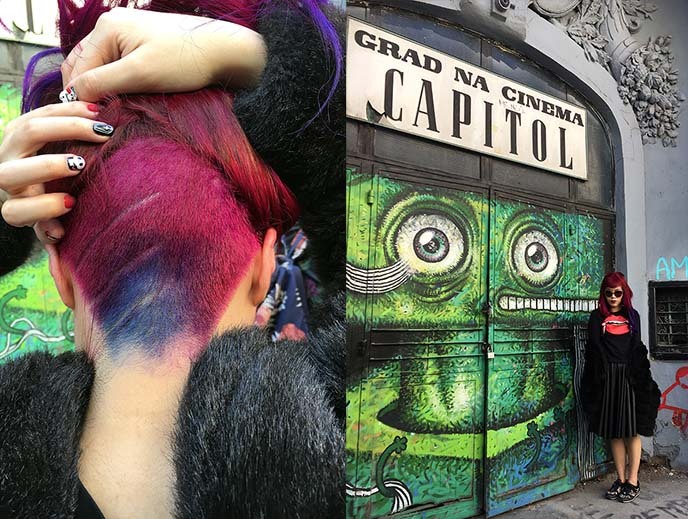 Alternative Bucharest: a hip, street art walking tour! 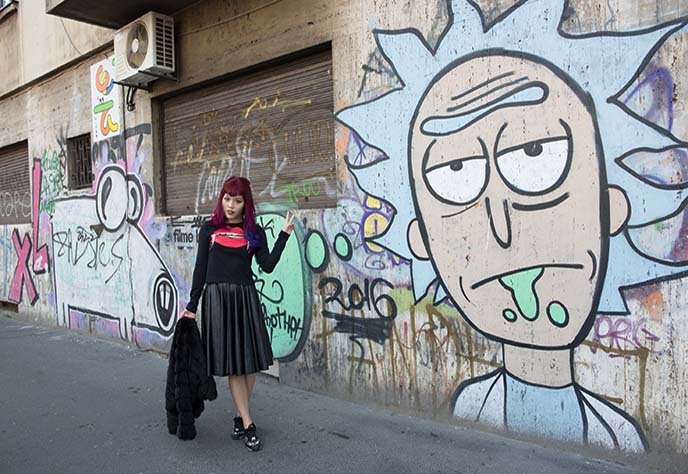 Rick & Morty Romania mural, travel influencers press trip. Dark greetings from Bucharest, Romania! As you can see from my vampire fangs top, I was excited to be in the land of Dracula for the first time. 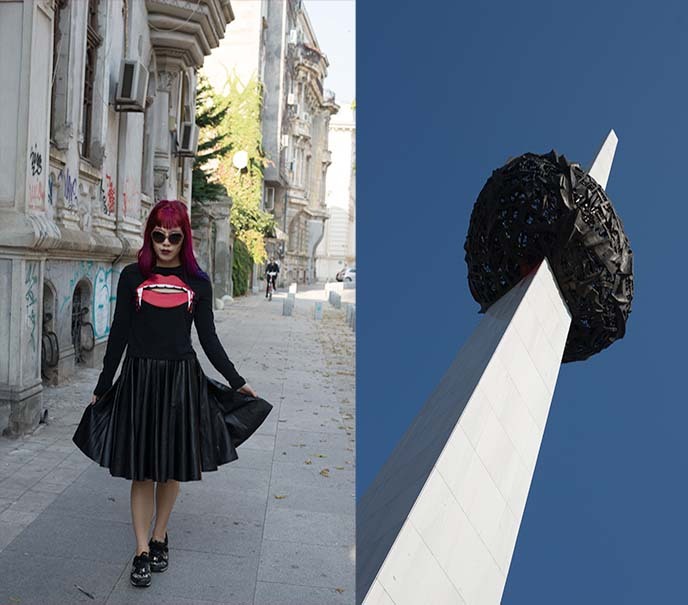 In Part 1 of my Bucharest series, I shared a Gothic photoshoot in a graveyard, and my speech at Experience Romania conference. 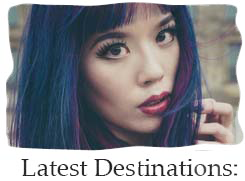 This event invited travel influencers / bloggers / writers from around the globe, to discover the best of this Eastern European nation. 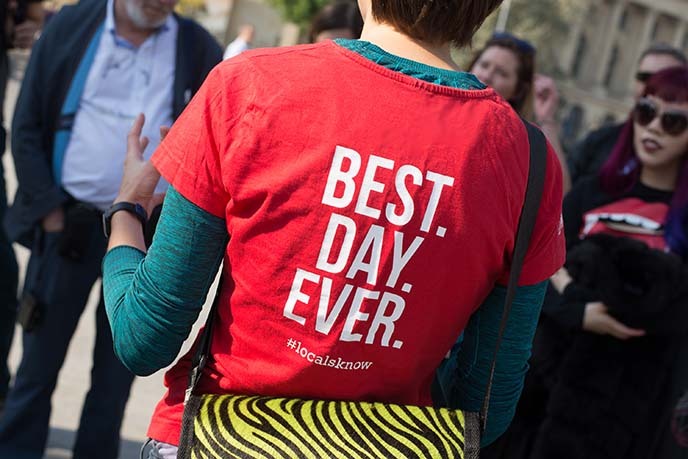 During the three-day event, the volunteers organized optional activities — including small-group walking tours led by Urban Adventures. 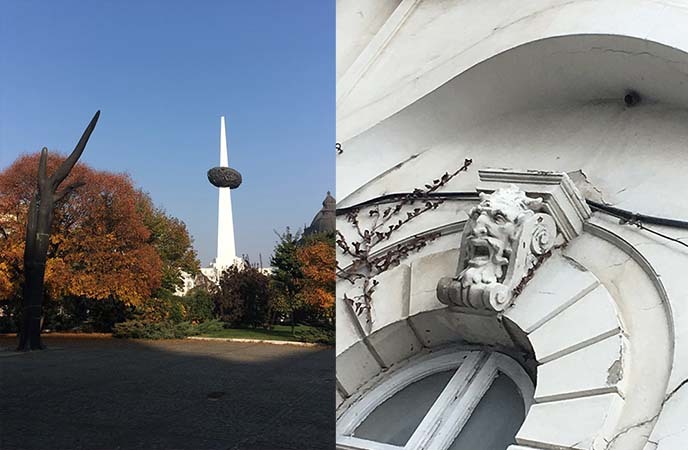 Photographer Joey Wong and I signed up for the “Alternative Tour of Bucharest,” a three-hour walk that let us discover street art, emerging artists, and abandoned buildings in this beautiful city. Our guide took us to historical gems like the Grad Na Capitol Cinema / Summer Theatre. It opened in 1912, but was damaged by a 1977 earthquake and then abandoned. Thankfully, the theater is now being re-vamped. I was glad to see the building maintain its classic arches and carvings, while looking to the future with alien-like street art. Outfit of the Day: Since I was going to be in Dracula’s homeland, I couldn’t resist picking up this bloody vampire fangs cut-out top from H&M’s Halloween collection. This was only available during spooky season, but you can find a similar style vampire shirt here. 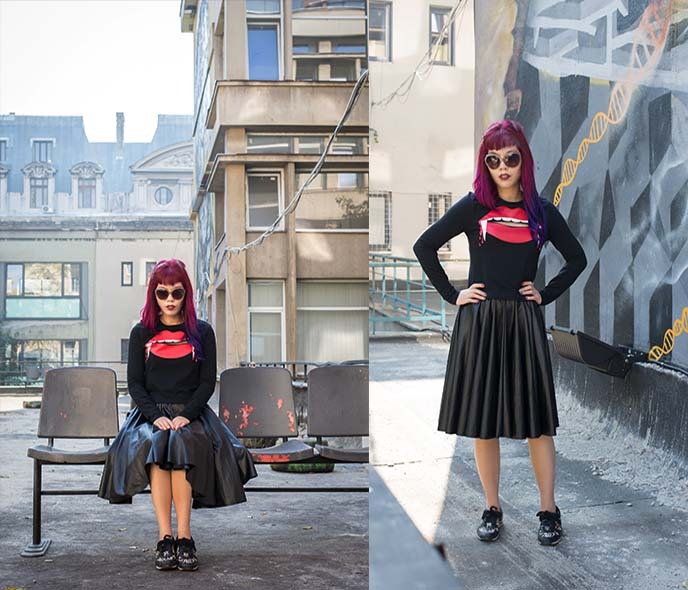 My long leather skirt is by Erbert Chong. It’s similar to this skirt, and this faux leather version. The sunglasses are Balenciaga. The sun was shining (in late October! 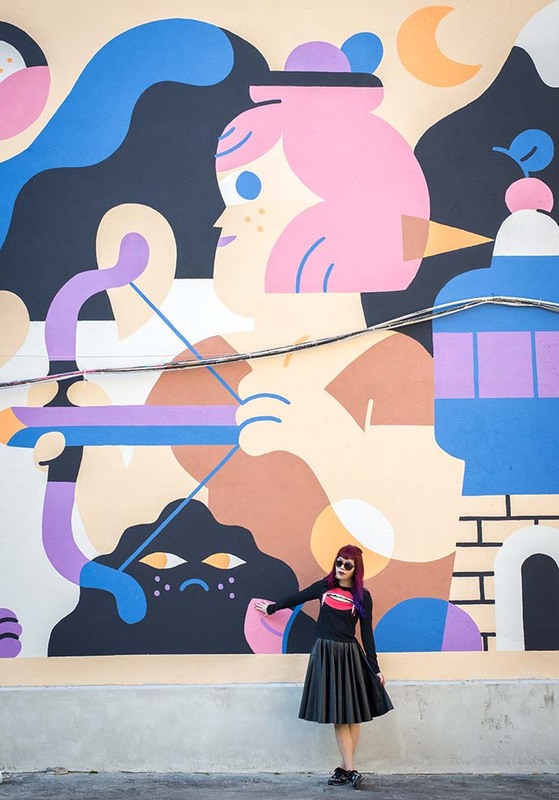 ), and Bucharest’s walls were a rainbow of street-art… The perfect conditions for a photoshoot. 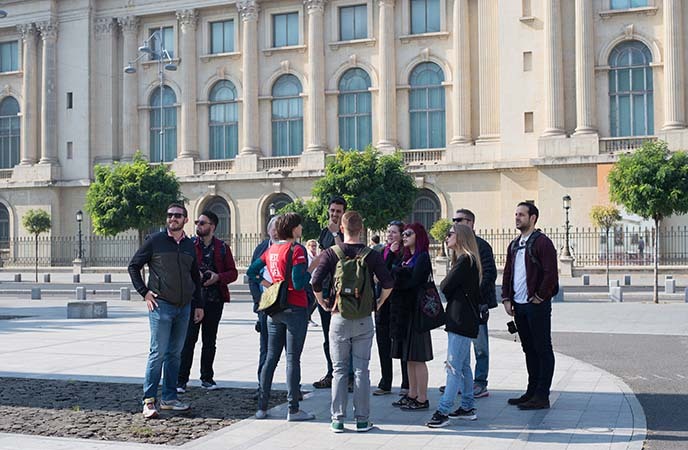 Once again, we had an enthusiastic, knowledgeable young guide who showed us Bucharest’s hidden and offbeat sides. Our guide Elena pointed out works by local creators, which you can spot on walls all throughout the city. This adorable pig-puppy creature is by AEUL. Urban Adventures always incorporates local flavors into their tours. 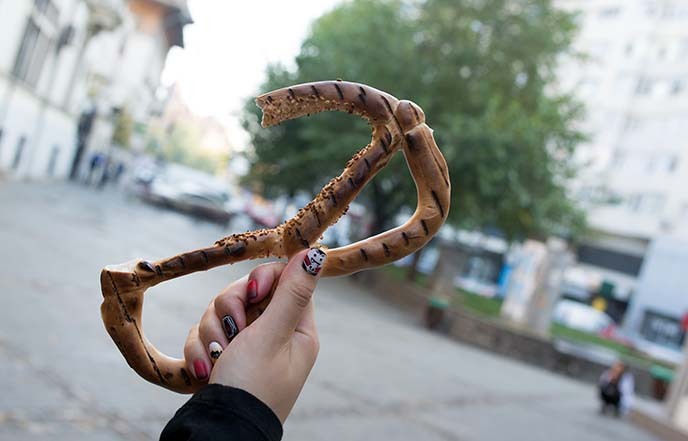 At the start, Elena handed us each a “covrig,” or Romanian pretzel to try. A bit like the simit I had in Istanbul, this is a delicious fresh-baked bread topped with poppy or sesame seeds. No wonder it’s a favorite snack among locals. 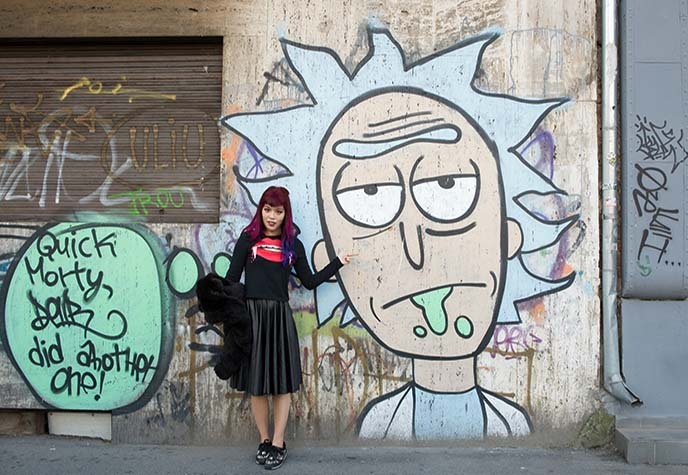 “Quick Morty, **** did another one!” Looks like the drooling Rick Sanchez made a stop in Bucharest, between his space-flights to alien galaxies. I was pleasantly surprised by Bucharest’s street art, which is colorful, edgy and well-executed. Urban Adventures took us to this stretch of wall with panels by different artists. 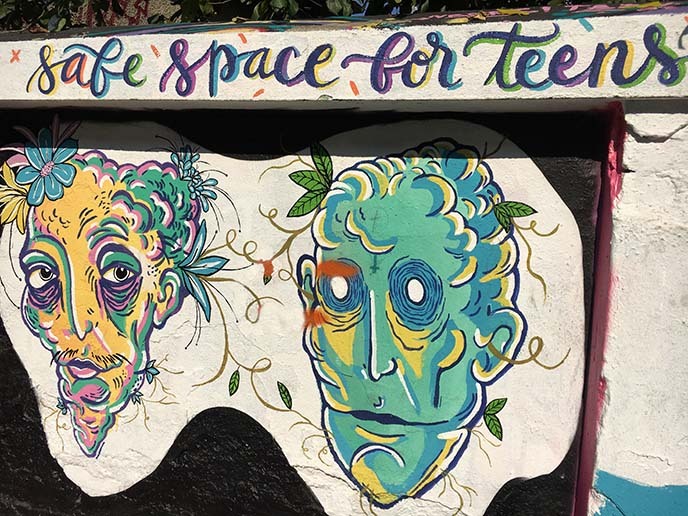 A safe space for teens, with heavy metal upside-down crosses… rock on. Romanian street art gets an A+ from me. The paintings on this wall were beautifully rendered. The artists do a fantastic job at incorporating the natural landscape into their works. 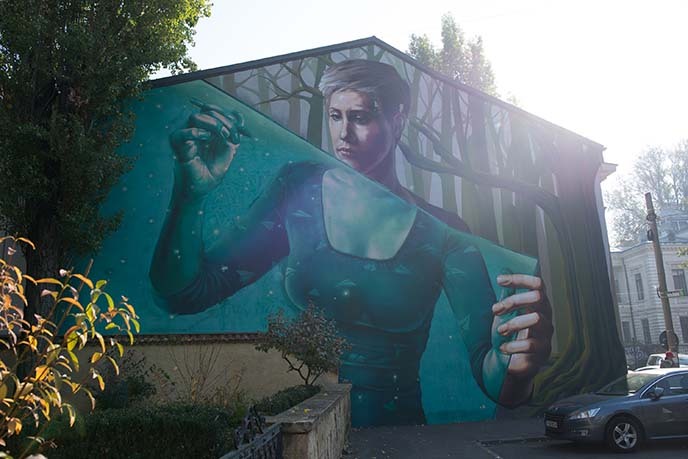 One of the most iconic Bucharest murals is this one by Sweet Damage Crew (Point Art Space, on Eremia Grigorescu street). It spans the side of an old residential building, and creates the illusion of a tree growing out of the painted trunks! 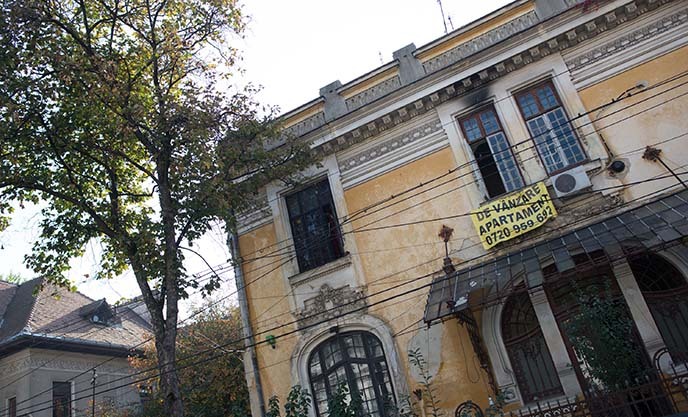 Our guide showed us the exteriors of a few abandoned residences, which are a common sight around Bucharest. These crumbling urban ruins are fascinating examples of “beautiful decay,” which is the topic of another Urban Adventures walking tour. I think I “dressed for the occasion,” wouldn’t you say? Vampire cut-out shirt by H&M, similar to this top. 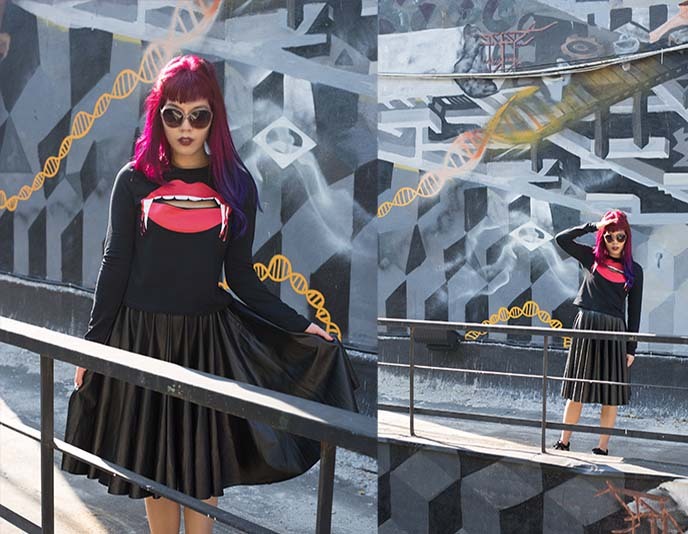 Leather skirt is similar to this one, as well as this vegan leather version. My shoes are similar to these leopard print TUK creepers. You know you’re in the lair of Count Dracula… when a pedestrian walk sign becomes a vampire-hunter holding a wooden stake! 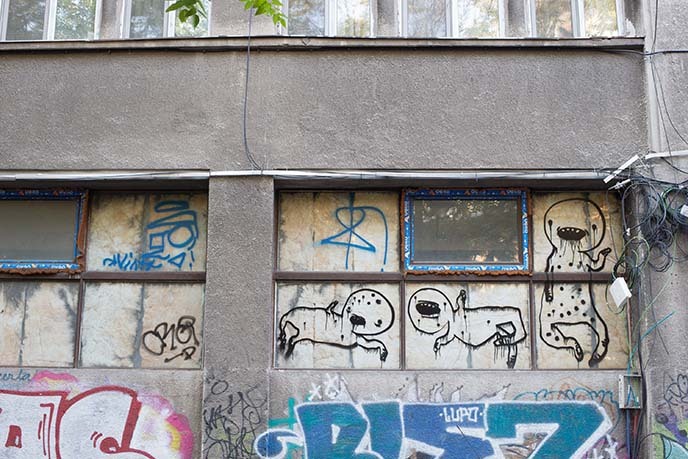 Speaking of monsters… it appears Bucharest has been infested by baby aliens with toes for limbs. These little guys are hanging out and waving to you from various vantage points. They’re creepy-crawling over this hipster warehouse. Bucharest’s creative street art even has 3D components. 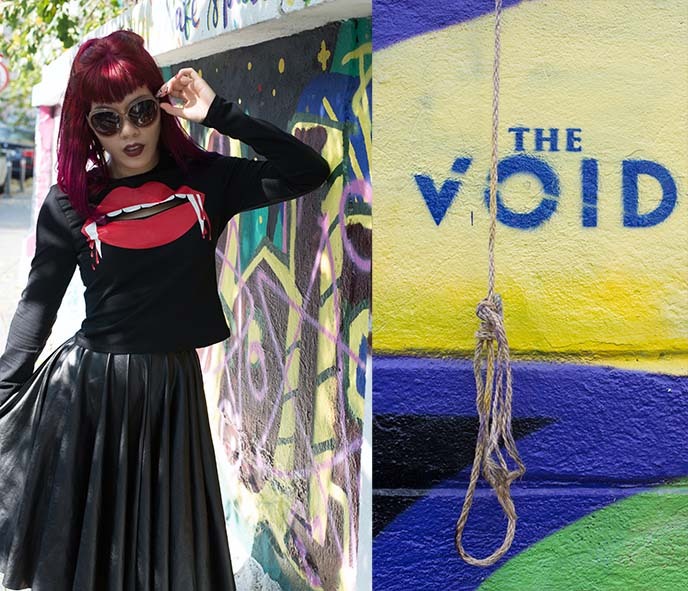 I noticed a morbid noose hanging down, next to a sign that says The Void. In addition to modern urban art, we also got a taste of Romanian history. 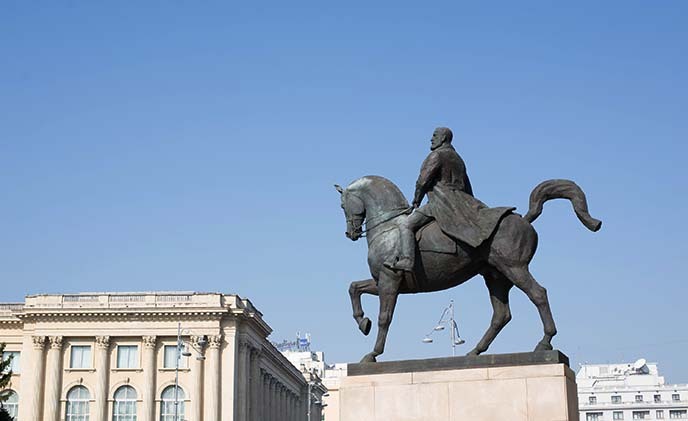 Elena took us to Revolution Square, framed by a statue of King Carol I riding a horse. She pointed out bullet holes and fire damage on buildings, caused during the Revolution of 1989 that overthrew the Communist dictator Nicolae Ceauşescu. Quite the moment to stand here, and see the balcony where Ceausescu gave his last speech. Is that… a speared, burned potato? An egg on a skewer? It’s actually the Memorial of Rebirth: erected in 2005 to commemorate the people’s sufferings during the 1989 Romanian Revolution. Many complained that the pillar was too abstract to convey the meaning of the memorial. In 2012, someone showed his/her frustration by throwing up a balloon of red paint, which stained the pillar. The “dripping blood of the pierced potato” remains there today… and adds a vampire vibe, if you ask me! 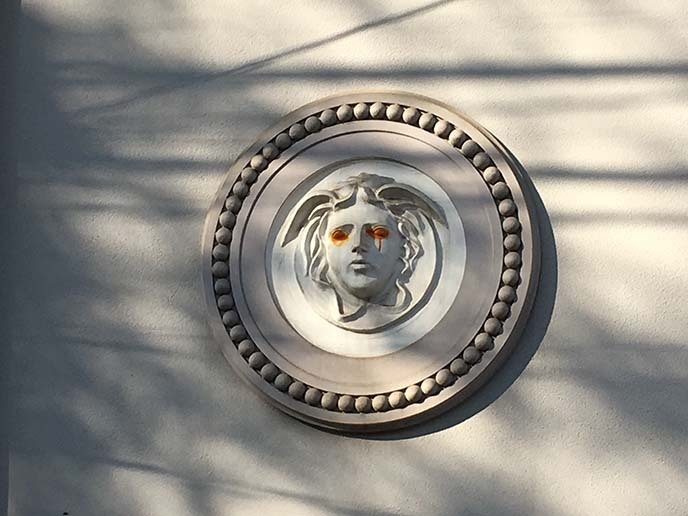 This devilish, horned face in a circular plate caught my attention. Someone gave this creature an orange eyeshadow makeover. 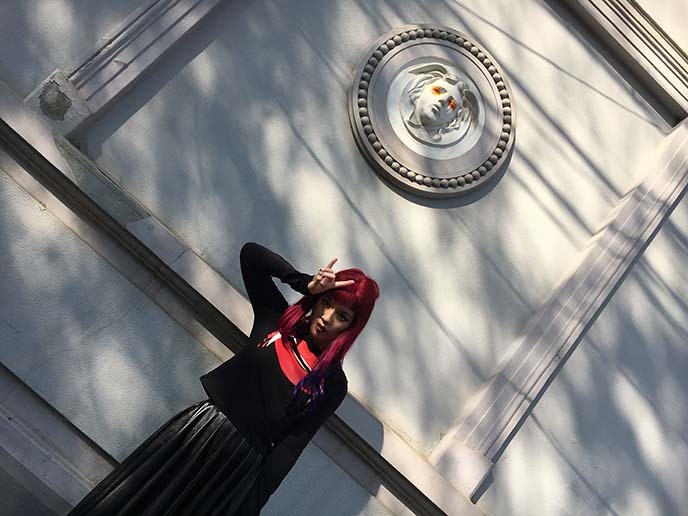 Classic architecture meets glam rock: I’m into it. Such a great way to see Bucharest’s hip, underground culture — and with a group of fellow travel bloggers / journalists / vloggers. Very grateful to Experience Bucharest for organizing this influencers press trip, which included three days of food, parties, tours and networking activities. I had the wrong image of Romania as a dark, somewhat unfriendly “Soviet / Communist” place. Bucharest reversed my expectations entirely. The city has a contemporary, cosmopolitan, European feel; much of the architecture is inspired by French and classical styles. 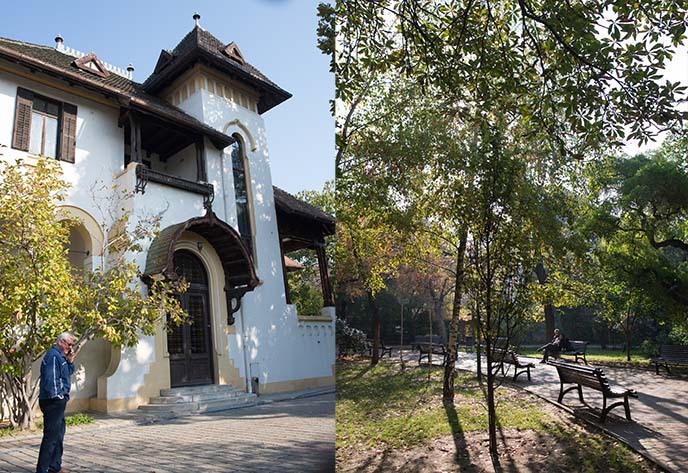 I was especially delighted by Bucharest’s public parks and gardens. They’re lush and beautifully designed — I couldn’t think of a better place to relax outside on a bright day. However, to my great pleasure… Dracula lurks in the shadows! I enjoyed seeing Goth elements like this black crucifix door handle to an Eastern European church. So death metal. As a “Dracula aficionado,” I got vampire nail art to match the theme of my journey. 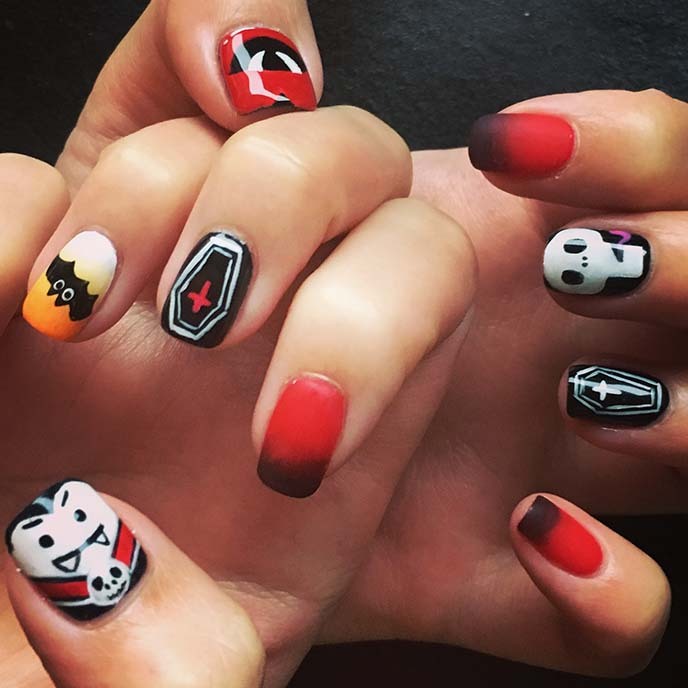 I spy a bat, coffins, fangs, bloody gradients, the evil Count, a skull… Bravo to Glam Nail Studio (award winning Japanese nail salon in Vancouver, Canada) for the intricate designs! 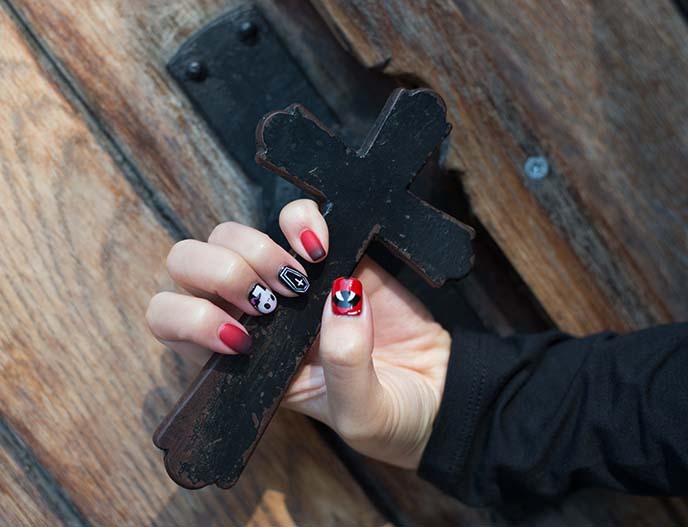 These gel nails were painted by hand, by owner Keiko Matsui. 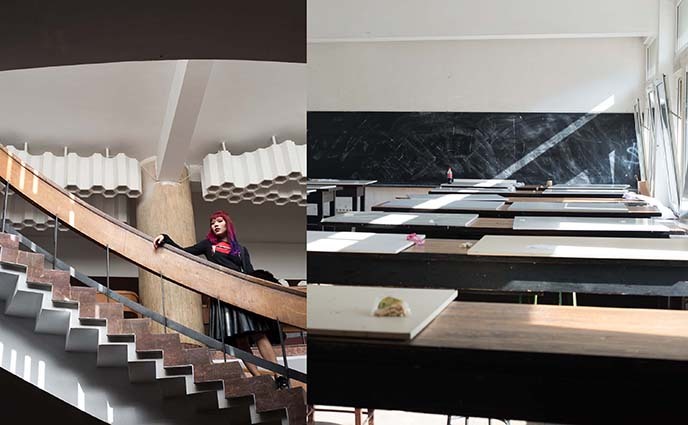 Our final stop: a peek inside Bucharest’s architecture school (UAUIM, Ion Mincu University of Architecture and Urbanism). Founded in 1952, the building has a modern design with a winding central staircase, and light fixtures reminiscent of honeycomb. 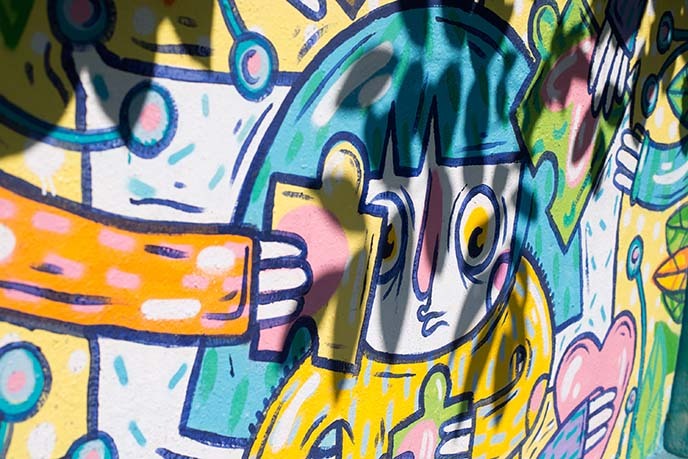 Urban Adventures filled us in on a little secret… the back patio / rooftop area is decorated with giant murals. The helix and mathematical themes fit in well with school of architecture. I relate to the little emo black cloud. Aren’t these Romanian artists talented? My blood-dripping fangs shirt hints at only one aspect of Bucharest. I was glad to discover that this is one bright, artistic, hipster city. Thanks to Elena and Urban Adventures Bucharest for the engaging underground tour. 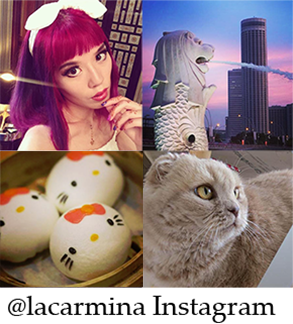 They also offer tours with food tastings, biking, dark side legends, history, and much more. A few of us were craving caffeine, so we went to hang out at T-Zero Coffee Shop. 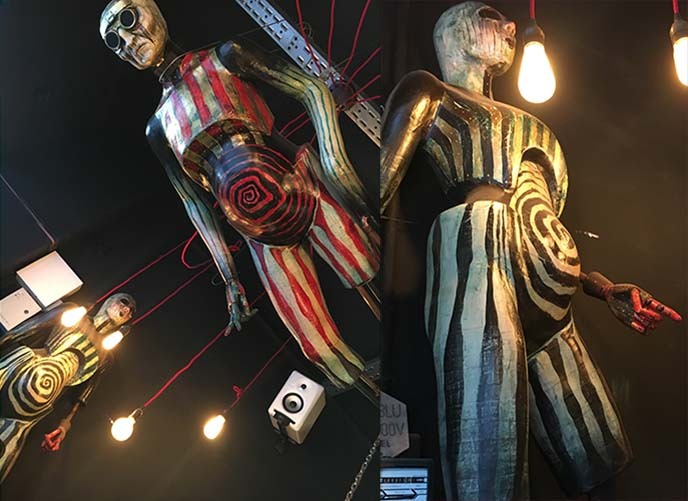 A delight to sip a flat white, beneath these spooky hanging mannequins (they have a Saw horror movie vibe). I wanted to know if Bucharest had a weird, hipster, underground side — and was pleased with everything I found. Cheers to Experience Bucharest and all the volunteers who made this tourism event possible. They brought in a hundred travel / digital media leaders from around the world, to see what Romania has to offer. 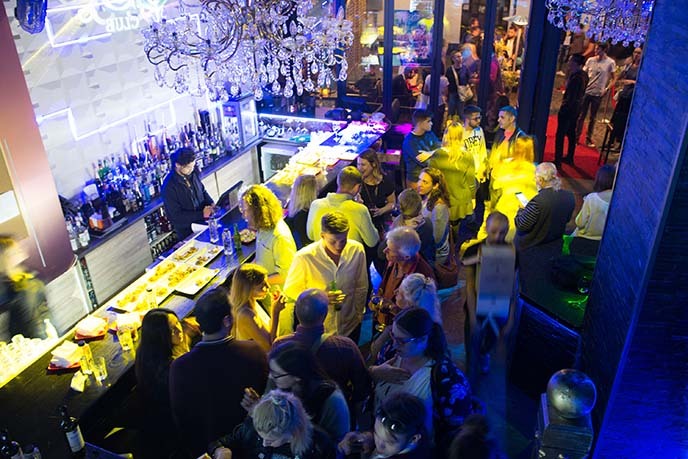 Shout out to S-Club Bucharest and Nomad SkyBar for hosting two of the group dinners and parties. It was a dream to finally come to Romania and sink my claws into the vampire legends. Next, I’ll share stories of Vlad the Impaler, and a visit to Bran Castle in Transylvania. 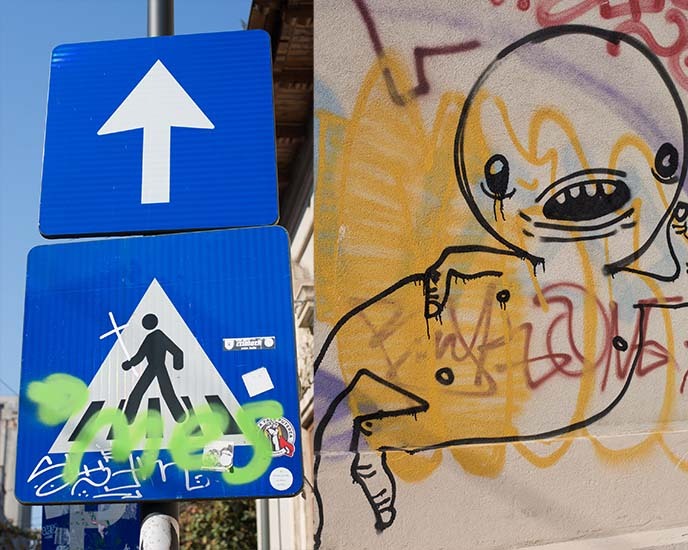 “Mortyyy!” I hope my street art walk revealed an unexpected side of Bucharest. Now it’s your turn to travel here, and “get schwifty” with Rick Sanchez! 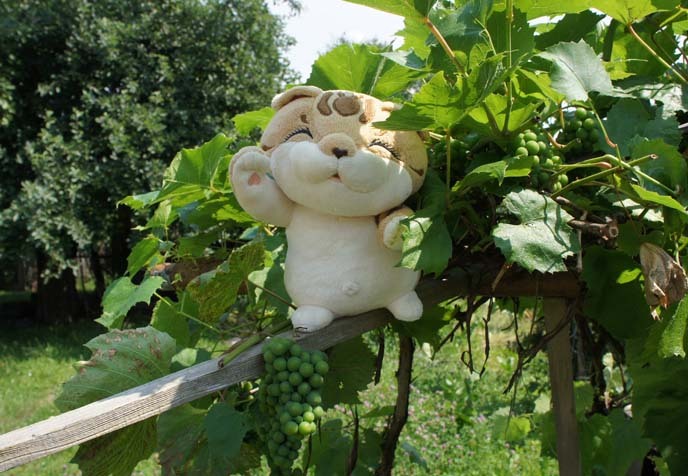 My cat went on a Stuffed Toy Tour of Poland with Panda Tours! Travel agency for toys in Europe. For me, 2015 has been all about voyage-voyage. It’s only September, and I’ve already flown to a dozen countries this year. 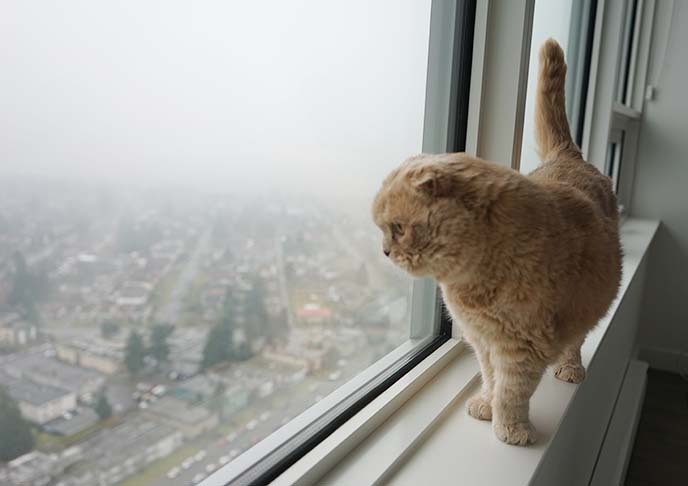 It’s too bad my Scottish Fold cat can’t travel with me… Basil Farrow always likes to look out the window, his round face full of curiosity. However, thanks to an innovative tour company, he got to have a foreign adventure of his own. 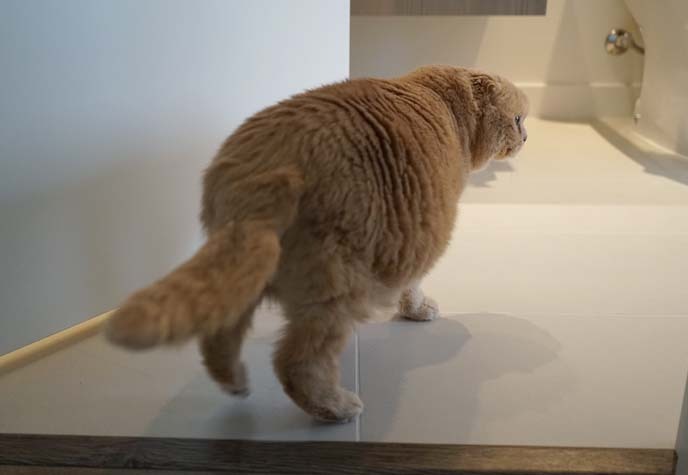 Read on to find out how Basil visited a country I’ve never been to, with a group of furry friends! Basil and I got an intriguing “press trip” email from Panda Tours, a travel agency that creates vacations for toys. The owner, Agnieszka, offered to send one of my stuffed animals on a customized tour of Poland. Basil convinced Panda Tours that he’s a “plush kitty” (the above photos are proof enough) — so I put him in a box, and mailed him overseas. A few weeks later, Panda Tours emailed me to confirm he had arrived and was napping soundly. And so, the journey began! I looked forward to waking up every morning and checking the PandaTours Instagram, where I could see Basil’s day-to-day activities. I’m usually the one posting updates from foreign countries, so it was fun to have the tables turned. I’m sure you will smile at these photos… so read on. 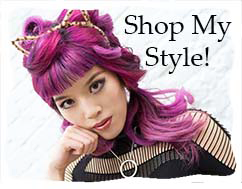 More here!